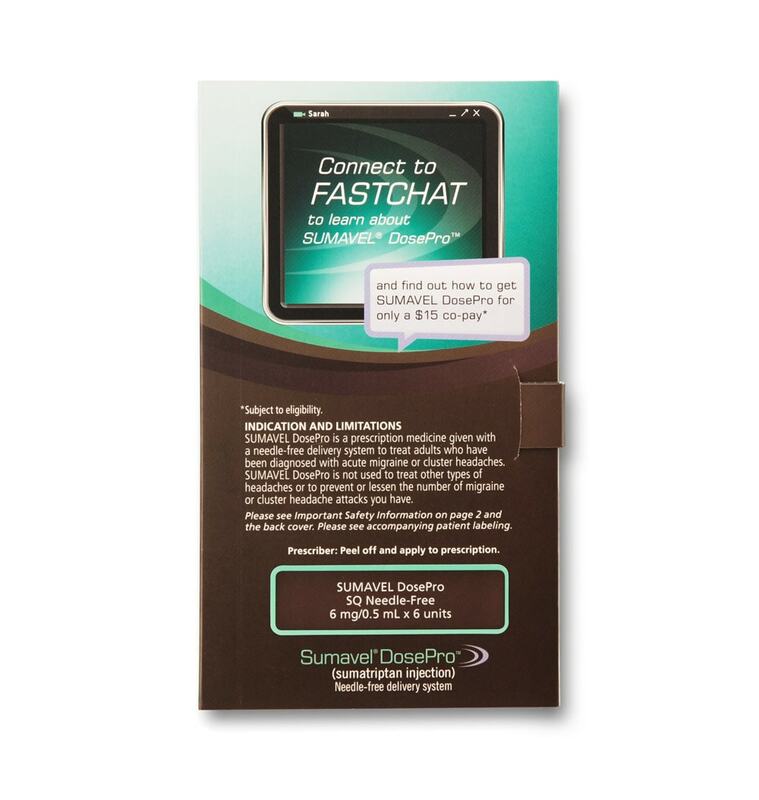 In launching a new delivery system for its Sumavel product, Astellas needed to create a starter kit to help educate its patients about the product and the clever new delivery system. Like most healthcare products, there is important complex information that the brand has to convey to patients and physicians. Finding an effective tool to communicate this information to busy consumers is a tough challenge facing many healthcare marketing groups today. 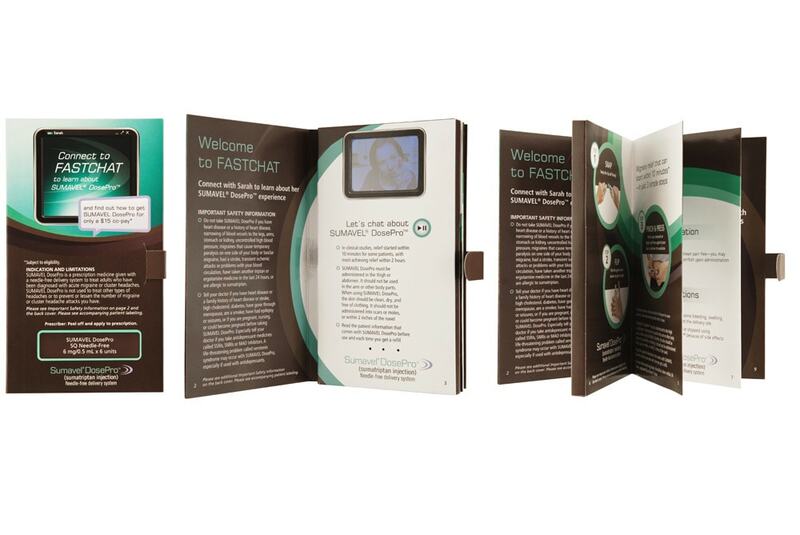 Astellas and its healthcare agency Cement Bloc partnered with Americhip to utilize our patented Video in Print™ technology to develop a sleek and highly informative Patient Starter Kit. 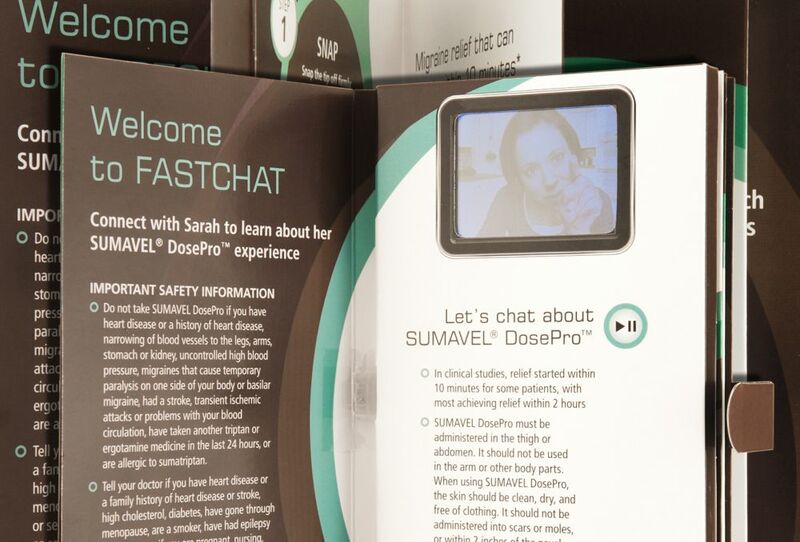 The video content was framed as an online “Fastchat” with a typical patient named Sarah. Shot in a very casual style with Sarah sitting at her kitchen table, patients learn about the product and its innovative delivery system in a very direct and straightforward manner. Through the video, Astellas is able to answer common patient questions and to deliver key information that will improve the overall patient interaction with the product. Even better, Sarah is then able to actually demonstrate exactly how to use the new product. 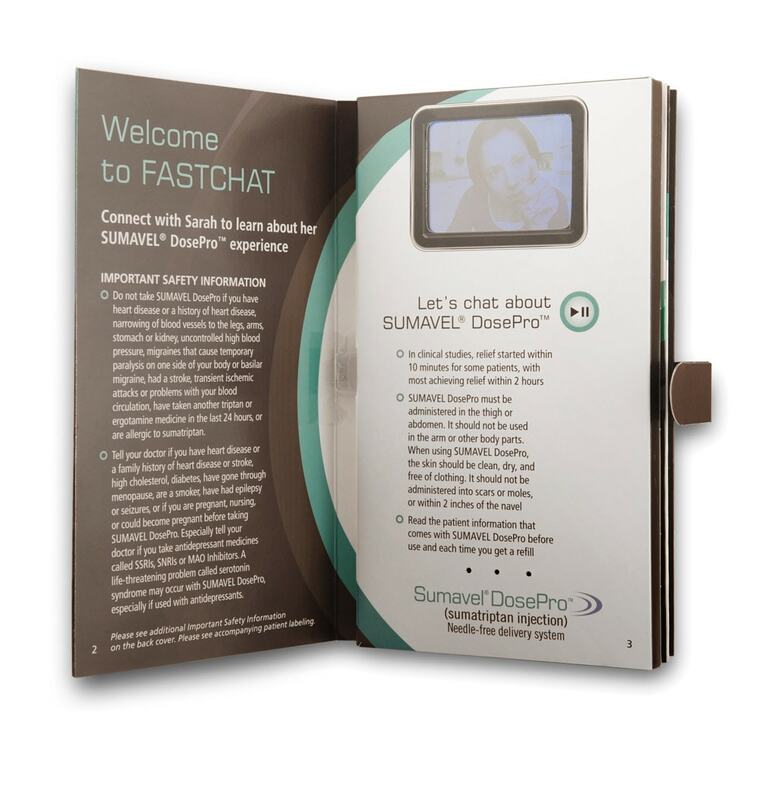 The combination of the video technology and the photos included on the video brochure’s multiple pages provided the perfect tutorial to allow patients to utilize the new system with confidence. The patient starter kit was a major success for Astellas. After spending six weeks analyzing the feedback and data from the initial run, Astellas committed to a large re-order of the product. The major support for the VIP® Starter Kit came from the Sales Reps in the field. The doctors had told the Reps that they believed the new delivery system was effective, but they could not afford to be burdened with having to instruct every patient on how to use it. The doctors advised Astellas’ Sales Reps that the Video in Print™ Starter Kit was so important to support the launch because it so effectively communicated all of the necessary information and did not tie up the doctors and their staff. Given the strong push from the field, Astellas committed to a re-order of the video brochures that was four times the initial order quantity.